Mountain goats are one of those animals that I never thoughout I’d run into out on the trail. Throughout my life, I’ve read about bears, mountain lions, wolves ETC, but I never thought about Mountain Goat Safety. I knew that Mountain Goats make their homes throughout the mountainous regions of the Pacific Northwest, but I was shocked the first time I saw one in person. What should you do if you encounter a mountain goat on the trail? Are they aggressive, or just surprised to see someone high on the summit? When hiking in areas that mountain goats call home you need to think about your safety. Hiking, camping and climbing through mountain goat country provides great challenges and personal rewards. You get those opportunities to interact with mountain goats that few people will ever experience. These encounters can be either positive or negative depending on how you handle it. Interactions between goats and people have been happening for 100’s of years and we’ve learned a lot about how goats interact with their surroundings. Goats typically aren’t aggressive towards people, they’re just curious powerful creatures. That being said, they have been known to ram people when defending their turf. If you’re going into mountain goat territory, here’s some practical advice to guide your interactions. When you encounter mountain goats on the trail it’s important to keep a few things in mind. Mountain goats are generally safe, but you should still give them a wide berth and try to avoid close interactions. 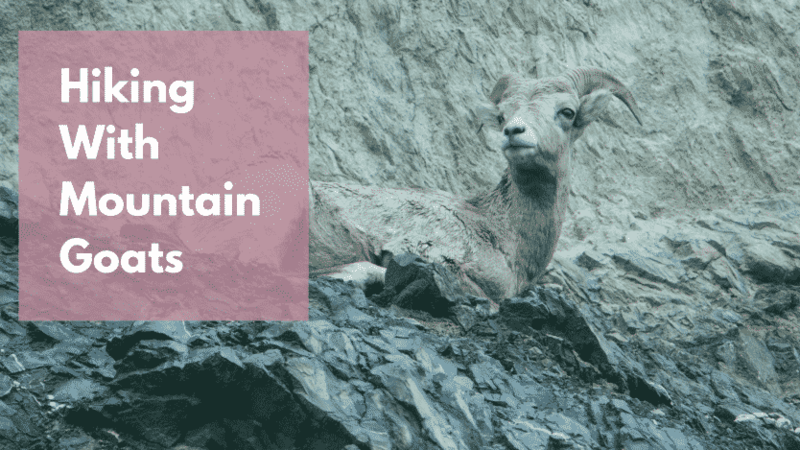 Here are a few things you should know about mountain goats to guide your interactions on the trail. Goats Aren’t Scared: Mountain goats live on very high/steep terrain and that’s how they stay away from predators. Predators rarely venture that high, so they never developed that flight instinct. So they typically don’t run away from people when you approach. Love Salt: Goats have a natural hunger for salt throughout the summer months. They’re attracted to natural salt licks and that’s where they spend most of their time. Human urine is another source of salt for goats and they will be drawn to anywhere you pee. Curious and Aggressive: Even though goats seem non-confrontational at first they can quickly become aggressive. Within goat society, they go from being gentle and docile to butting each other in the head. They can be just as aggressive with humans. Sometimes you aren’t going to be able to avoid goats, but if you can try to stay 50+ yards away. If they’re on the trail and you can’t avoid them approach slowly and talk firmly to let them know you’re there. Most of the time they’ll go on their way, but if they don’t consider turning around and heading back early. Remember that even though goats look cute and cuddly they’re still wild animals. It’s up to you to to stay safe and give them your room. If the goat wants the trail let him have it. Back off and give the goat the right of way. On some peaks there’s just not going to be enough room for both man and goat to hike safely. Do your best to avoid luring him in and try to scare them away. Nobody wants to get rammed in the gut high up on the mountainside. Don’t let him get into your personal space. Make sure you keep track of all your gear. Try to make sure your pack is secure and there’s nothing on it to attract goats. Hiking up to a tall peak your gears going to have some sweat on it so don’t let goats lick and chew on your gear. When you see a goat the first thing you want to do is start talking to it in a regular voice. Just let him know where you are and that there’s not enough room for both of you. Cramming the two of you into tight quarters is a recipe for disaster. Most of the time he isn’t going to approach on a narrow trail. Start off calm, but if that doesn’t work don’t be afraid to yell and wave your arms. Project your voice and stand your ground. What if The Goats Aggressive? If the goat gets aggressive high up on the trail try to stand your ground. Remember that you’re in his territory and he’ll tear you up in a second if things go bad. Be loud wave your arms and yell. If that doesn’t work you might even have to start throwing rocks in his directions. You have to assert your dominance and defend your personal space. Most of the time the goat will move away. Just make sure you report the aggressive goat to the park rangers. Note: Only follow these directions Winter-Summer you’ll find my Autumn directions below. For both your safety and the goats never allow goats to eat human food. Don’t feed the goats and never allow them to eat the salt off your gear. Hikers need to urinate at least 50 feet away from the trail. Goats are naturally attracted to the salt in your urine so it will bring goats closer to the trail. Lots of hikers peeing along the trail will eventually create a long attractant throughout the entire trail. As summer passes and autumn approaches the mating season begins. Most of the time goats aren’t approaching the salt during the fall. They see you as a mating threat so give him space and don’t challenge him. If you yell at him he will likely charge so be careful. Give him plenty of room and try not to look like a threatening competitor. There’s nothing quite like seeing mountain goats in their natural habitat. They’re a magnificent creature that’s truly beautiful. If you follow these guidelines and give them some room you should be perfectly safe on the trail.